Truth is defined differently inside the Beltway — especially in the hands of the government. The FBI rarely record interviews, preferring instead to rely on written summaries known as 302s, which are widely help up in court as credible evidence of conversations even though defense attorneys routinely debunk their accuracy and credibility. 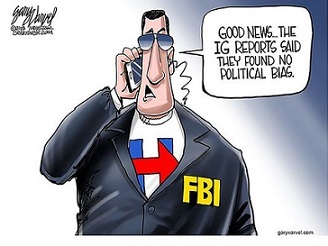 So no matter how honest and factual you may be during FBI questioning, you could still face legal peril if your statement fails to harmonize with the FBI – “trust me on what I heard” – memos. Federal agents have the right to lie to you without consequences yet, they will gladly put you in prison if you lie to them, unless of course you are a member of left-wing ruling elite. Making a false utterance of nothing more than a simple yes or no could land you in prison for 5 years and fined up to $250,000. Though other federal agencies cannot play the FBI’s game with 302 forms and the false-statements law, they have plenty of options for editing the public record. Inside the Beltway, “plausible deniability,” a phrase first publicly used by CIA chief Allen Dulles in the 1950s, is “close enough in government work” to truth. The FOIA law enacted in 1966 to make government accountable to the public is now being used and abused daily to hide evidence of misconduct. Another way the truth is hidden is through the 50 million plus decisions to classify information each year. The more the government can classify and withhold, the easier it is to manipulate public opinion with whatever real, altered or imagined facts they are willing to release. By selectively disclosing only details that support the administration’s policies, government prevents citizens from fairly assessing the latest power grabs or interventions. The more power government seizes, the easier it is to suppress the truth. The Justice Department can totally suppress embarrassing facts on the most contentious issues by invoking the “state secrets” doctrine. The George W. Bush administration routinely invoked state secrets to seek “blanket dismissal of every case challenging the constitutionality of specific, ongoing government programs,” according to a study by the Constitution Project. A federal appeals court slammed the Obama administration’s use of state secrets for claiming the judiciary should cordon off all secret government actions from judicial scrutiny, for immunizing the CIA and its partners from the demands and the limits of the law. Let’s face it; government’s sway over damning information is boundless at least until some whistleblower such as Edward Snowden obliterates their credibility. Unfortunately, Americans have no legal way to commandeer government files until long after most power grabs are consummated. Pervasive secrecy ensures that Americans are deceived far more than they realize. Politicians get away with lies in part because Americans are taught that anyone who disbelieves the government must be crazy — the same view the KGB took of Soviet dissidents in the 1970s. And these self-serving lies are compounded by kowtowing so-called experts and the drive-by media. In Washington, power is the highest truth. Credibility depends on titles, not veracity. Blind deference to authority might be expected from semi-literate peasants in some mountain hollow but, it is more of a problem coming from the academic elite and establishment heavyweights. Washington’s hypocrisy on lying shined brightly when Congress passed the Stolen Valor Act of 2006, which made it a federal crime to falsely claim to have received a U.S. military award. The Bush administration made hundreds of false claims regarding Iraq to justify its 2003 invasion; Obama lied through his teeth to support the Arab Spring and finance and arm possible terrorists; and, Hillary lied pretty much about everything that happened when she was Secretary of State and again running for president. But the Justice Department sees no problem with that duplicity. As a side note – the Supreme Court struck down the Stolen Valor Act in 2012 as a violation of freedom of speech. Lies subvert our Republic by crippling the ability to rein in government. We are left clueless until it is too late for the nation to pull back. Political lies are far more dangerous than most recognize. Big government requires Big Lies — and not just about wars but across the board. The more powerful centralized administration becomes the more abuses it commits and the more lies it must tell. The government becomes addicted to the growth of its own revenue and power — and this growth cannot be maintained without denying or suppressing the adverse effects of Leviathan’s growth. Ironically, despite the government’s long record of deceits, distrust of government is often portrayed as more dangerous than government power itself. Private doubts are supposedly a greater threat to America than official lies. Trust in government becomes mass Prozac, keeping people docile and compliant.